We make it extremely affordable to remove unwanted ink or past regrets from your body for as little as $8 per square inch! We offer packages to save you money…or a reasonable pay as you go rate if you cannot afford a large amount up front. Consultations are FREE and there is no pressure or obligation. We want you to feel comfortable with us before you commit. We use the Cynosure Revlite which is one of the most powerful lasers on the market today. An intense beam of light is aimed at the target area to gently remove unwanted ink particles without harming the surrounding skin. The laser energy is absorbed by the ink, which breaks it up and allows it to be flushed out of your system by your body’s natural cleansing process over the next several months. The procedure is similar to an airbrushing effect and you will see the ink frost over as we pass over it. While it can be painful, it takes only minutes to remove a very large piece, so it is very tolerable. We also sell numbing cream which can be applied to alleviate the discomfort. The number of treatments required depends on the size, location, depth and color of your tattoo. New and colored tattoos require more treatments than older, faded tattoos. Treatments are usually spaced around six weeks apart to allow your body to remove the maximum amount of pigment between visits. Black is the easiest color to remove. Color blends mixed with white or yellow (which includes green and some aquas…and pale colors like pink or baby blue) are typically the most challenging so they may require extra treatments or may leave a slight haze at completion. 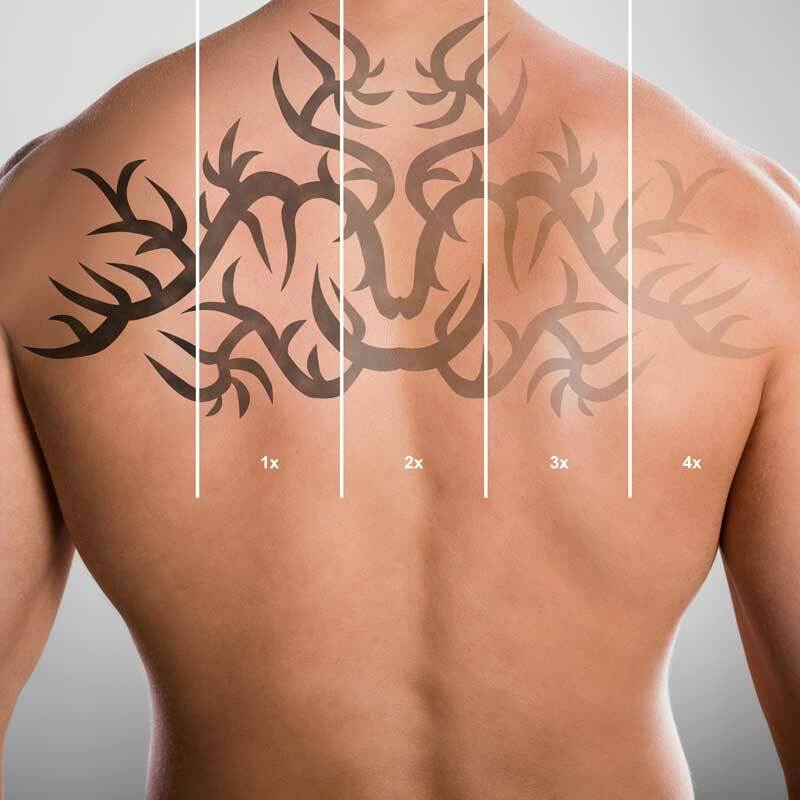 When all treatments are complete, most patients will see dramatic improvement in the appearance of their tattoo. In fact, the tattoo will often disappear completely and even when a haze is left it is hardly noticeable. However, as with any surgical procedure, and as success is dependent on many different factors, it is not possible to guarantee 100% removal for every client. We will carefully evaluate you at your consultation and give you an honest idea of your expectations.